BHC Ltd. are required by The Health and Safety at Work Act 1974 and The Management of Health and Safety at Work Regulations 1999 to publish and issue a statement of our health and safety policy. 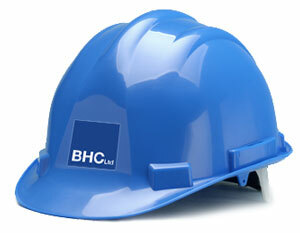 BHC Ltd. recognises and accepts its responsibilities in terms of the above legislation and regards health and safety as a matter of prime importance. BHC Ltd. is committed to ensure, so far as is reasonably practicable, the Health, Safety and Welfare of all Employees, Contractors and members of the Public. At the same time, due regard will be given to the protection and conservation of the environment in which we operate and live, by controlling pollution using the best available techniques. Information on company sustainability can be found here. We continue to develop and promote a pro-active and supportive health and safety culture and aim to maintain a high standard of health and safety by providing information, instruction, training and supervision for our Employees. This is achievable with safe systems of work, safe places of work and proper care and maintenance of all plant and equipment. As Managing Director, the ultimate responsibility for Health, Safety and the Environment rests with me and I will ensure that it is given equal priority with other major business objectives. Directors, Managers and Supervisors are required to implement the Health and Safety Policy in all their areas of responsibility and I will ensure that adequate resources, training and time are made available to implement health, safety and environmental programmes and systems. The effectiveness of the arrangements, identification of hazards and the elimination and control of risks depend to a large extent on the full co-operation, active support and participation of all Employees therefore, provision is made for Employees to be consulted, informed and, if necessary, trained in matters which may affect their health and safety at work and in connection with any responsibility or duty which may be assigned to them for the purpose of implementing this Policy. Also, under the Health & Safety at Work, etc. Act, 1974, all Employees must take reasonable care of their own health and safety and that of others who may be affected by his or her own acts or omissions at work; co-operate with their Employer to allow compliance with relevant legislation; report defects in safety systems or devices to their Supervisor and must not interfere with or misuse anything provided in the interests of health and safety. This policy will be monitored to ensure that our objectives are achieved and will be reviewed in light of legislative or organisational changes.